Opening its doors in January 2017 under the umbrella of Ramen Champion, Don Meijin is a donburi / rice bowl speciality outlet. 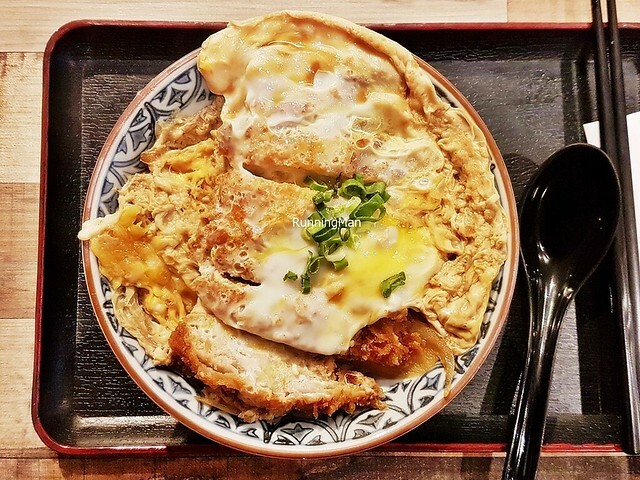 Despite their limited menu, Don Meijin still attracts the crowd with its tasty, well-executed, and fresh donburi / rice bowl. Ambience at Don Meijin shares much of it with the rest of the place. The brightly lit space is neatly lined with functional but comfortable wooden furniture. Warm, earthy wood and black tones abound. The open kitchen allows you to watch the team at work, but also means there is a faint smell of cooking lingering in the air. 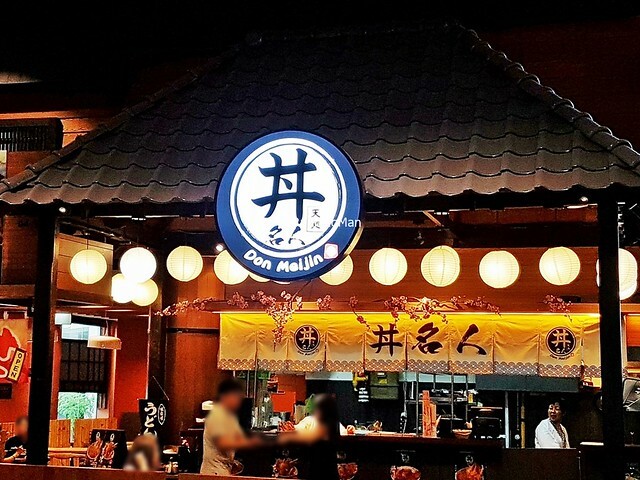 Service at Don Meijin is completely self-service, with ordering, collection, and payment over the counter. That said, staff display good product knowledge on the menu, and can describe dishes and make recommendations when asked. Empty / dirty tables are cleared rather quickly by the shared cleaning crew. 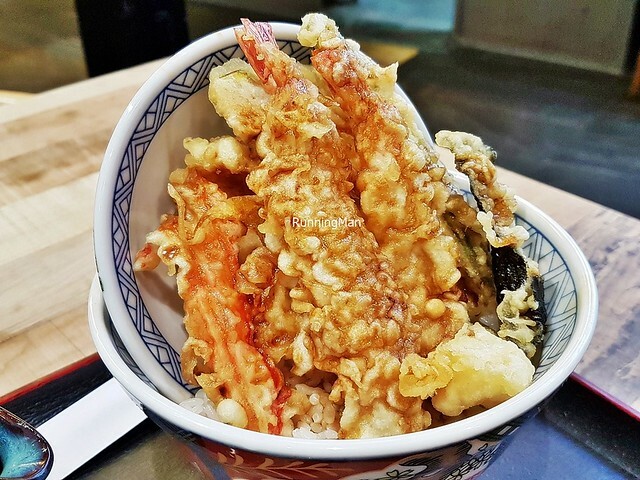 Food at Don Meijin is focused on Japanese style donburi / rice bowl. Freshly prepared to order and served piping hot, it's simple and comfortable. Ingredients are fresh, and being well executed, each dish is tasty in its own right. Portions are large and hearty for individuals. Prices are affordable, budget about SGD $15 per person for a meal here. 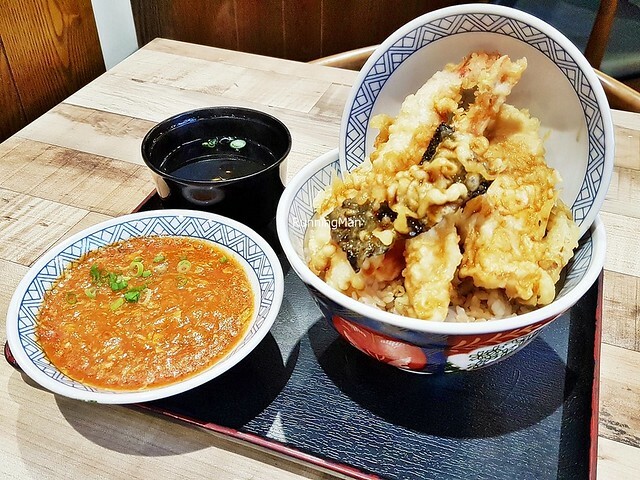 The Signature Tendon & Ochazuke Set (SGD $15.80) is a combination set meal, and is their star dish on the menu. 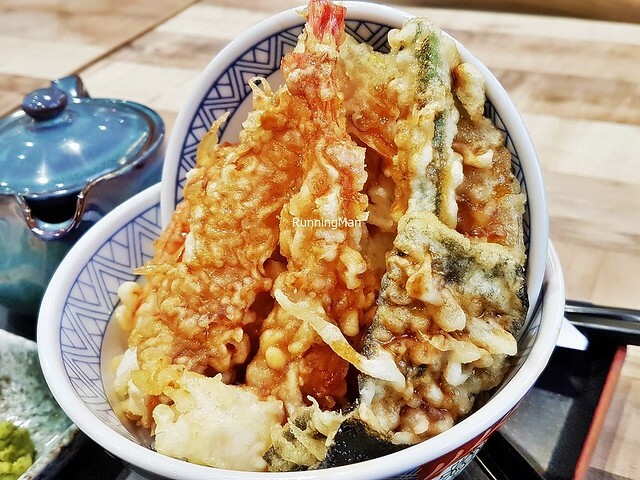 The Signature Tendon (SGD $13.80) features 9 pieces of well fried tempura, each with a light, crisp batter. I suppose the bed of white rice is the '10th piece'. Not too greasy, which is nice. 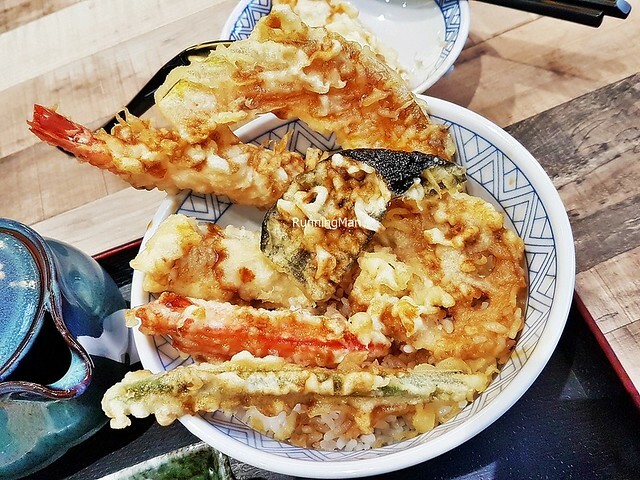 The fluffy white rice is imported from Hokkaido, Japan, and has a sticky texture with a delicate sweet grain flavour. 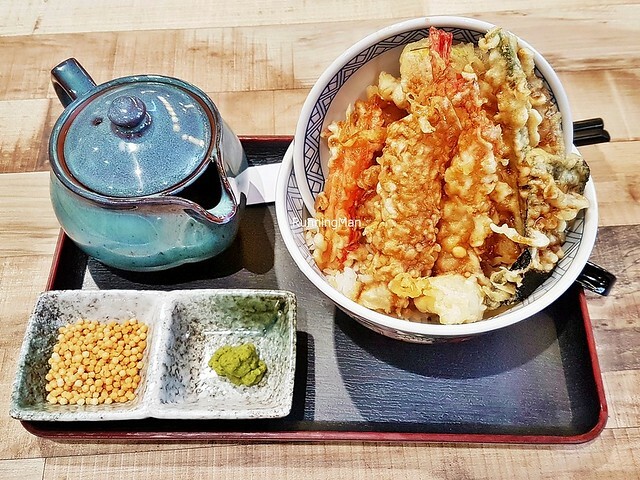 The 9 pieces of tempura include 2 each of sweet shrimp / prawn and fish of the day (usually john dory fish), with 1 each of seaweed, string bean, lotus root, crab stick, and pumpkin. The bowl is lightly drizzled with sauce, but I wish they were more generous with the sauce. 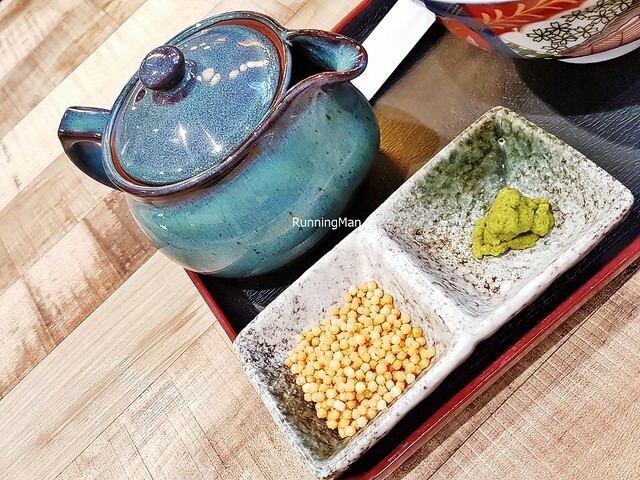 The Ochazuke Set (SGD $2) is served with a teapot of dashi / seaweed soup / broth, crispy rice balls, and a dollop of wasabi. 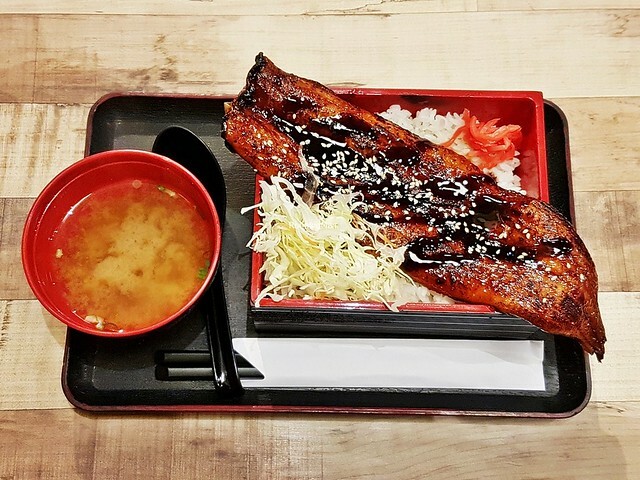 This is meant to be combined with any of the donburi / rice bowl. 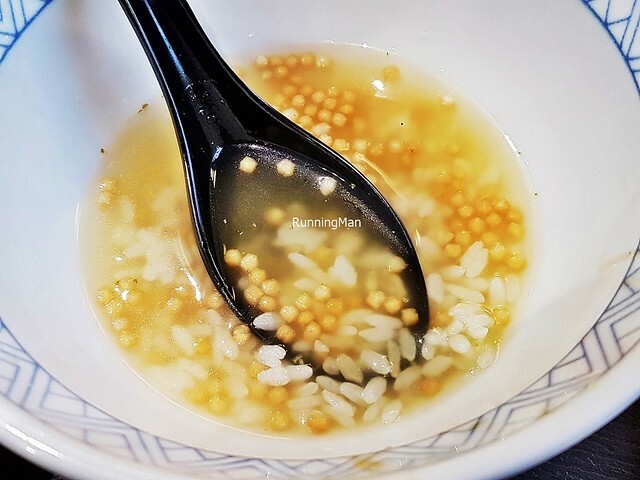 Once you're halfway through the meal, and have finished most of the ingredients, but still have remaining white rice, you're supposed to pour in the soup / broth, then mix in the rice balls and wasabi. This turns the bowl into a sort of comforting porridge, hearty and filling, with earthy sharp notes of flavour and a light crunch for texture. 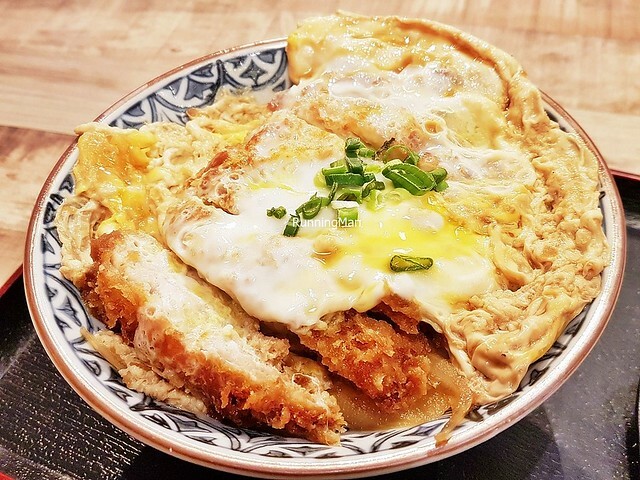 The Mille-Feuille Katsu Don (SGD $12.80) has a fillet of crumb battered pork loin, simmered in gooey egg and caramelised onions, served over white rice. Very flavourful, savoury sweet eggy, but this also means the texture of the batter goes limp. Texture of the pork loin borders between moist and dry, and it's a tad too firm. A good amount of meat juice and onion gravy pools in the bottom of the bowl, this actually gives the rice good flavour. Overall, I personally don't think it's that good. 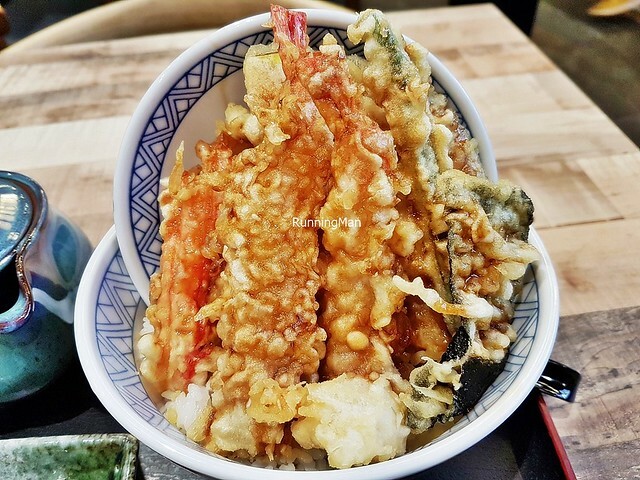 Loved the Whole Piece Unajuh Donburi (SGD $27.80) here. 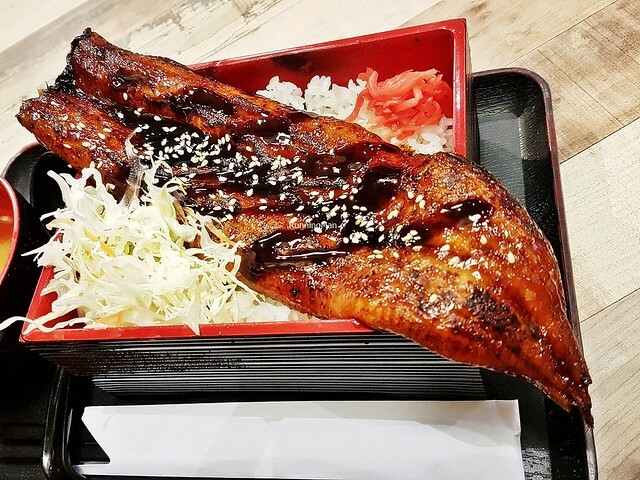 Riding on the trend of serving unagi donburi / unagi don / grilled freshwater eel with rice, this is a straightforward, well-executed rendition. 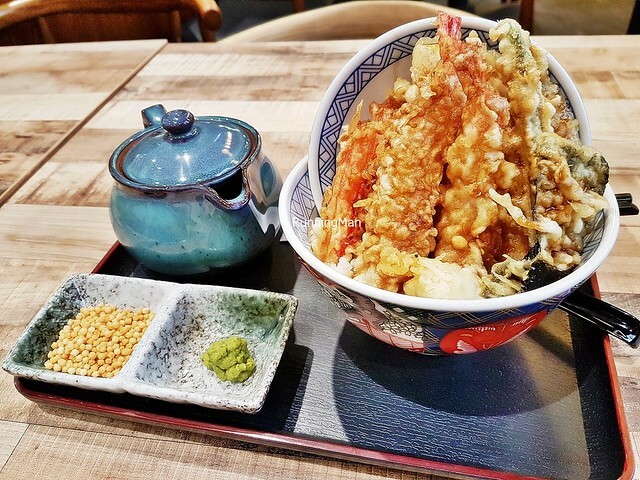 The rice is fluffy and sticky, served with fresh crunchy cabbage and sharp sour pickles, coated in a savoury sweet salty tare sauce or teriyaki sauce. 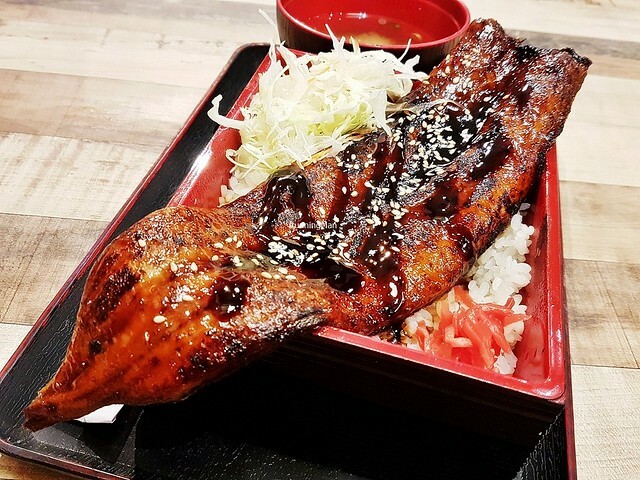 The large fillet of eel is soft, almost creamy in texture, with bold savoury sweet salty flavour that has a hint of briny taste, and a faint smoky aroma. The only minor drawbacks with this dish - a 15 minutes wait as it's prepared to order, and the slightly higher price compared to elsewhere. Still, I loved this delicious dish, and would order it again. Highly recommended! 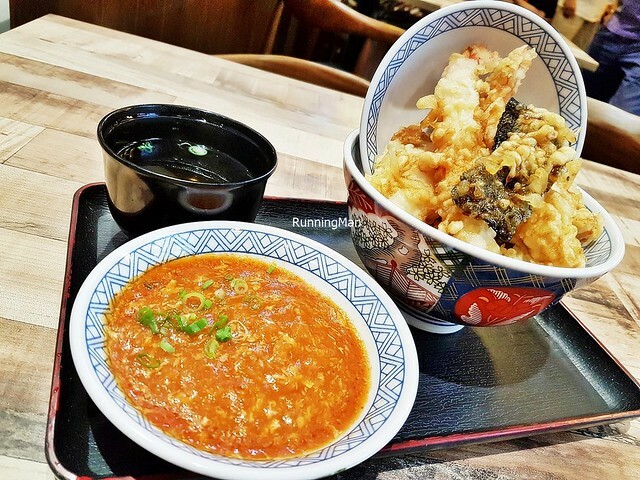 The Spicy Chili Crab Tendon (SGD $14.80) is essentially the same as the Signature Tendon, but served with a side of Chili Crab gravy. 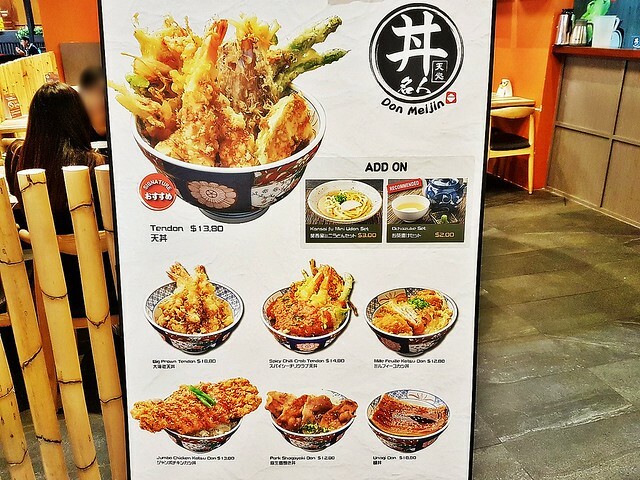 At first, I was puzzled, as their menu photo shows the gravy poured into the bowl, instead of on the side, but on reflection, I suppose it's to prevent the tempura from going soggy. The gravy has bits of crab stick and egg within, nicely sweet savoury with a light touch of spicy. Not bad, but I wish it was more fiery.